Where does the ARM industry fit on the Endgame Curve? Over the past few months, I have been asked repeatedly if the U.S. accounts receivable M=management (ARM) industry is consolidating. My short answer is yes, the ARM industry is in the midst of consolidation for the very first time. 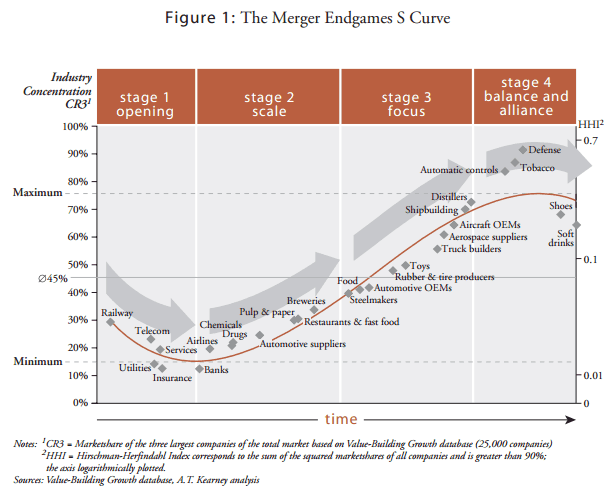 I did some research about consolidating industries and stumbled upon A.T. Kearney’s Merger Endgame methodology. The global management consulting firm analyzed mergers and acquisitions involving some 25,000 companies globally from 1988 to 2001, covering 98% of the worldwide market. They noticed a pattern emerging: their data took the shape of an S-curve, or what they referred to as the Endgame Curve. A.T. Kearney determined that once an industry forms or is deregulated, it moves between four different stages in a consolidation lifecycle: Opening, Scale, Focus, and Balance and Alliance. I evaluated how the U.S. ARM industry fits into these stages. This typically relates to start-ups or spin-off industries, and industries that are regulated or protected by tariff barriers or foreign ownership restrictions. A.T. Kearney refers to this stage as the frontier of industry consolidation; an expanse of limitless innovation, opportunity, and risk, particularly when protectionist restrictions are lifted through privatization and deregulation. The ARM industry went through this stage in the mid-1990s when Congress passed bills deregulating the telecommunication, utility, and banking industries. The resulting mergers in these sectors impacted the collection agencies that served these industries. In the Opening Phase, entry barriers are generally low, which explains why there are so many companies. In the mid-1990s, there were as many as 7,500 collection agencies in the U.S. and barriers-to-entry were virtually nonexistent. New collection agencies opened at a rapid pace with very little starting costs. Opportunities developed, competition heated up, and companies raced to gain footholds within the markets they served. Overall, the 90s were a period of expansion in the U.S ARM industry, and the smell of opportunity attracted the interest of private equity firms and entrepreneurs alike. A profitable business opportunity stimulates players to move into the market. The ARM industry at that time was highly fragmented; there were many players, but the industry was not consolidating. The need for scale or global reach pushes strong players to expand, either through organic growth efforts or M&A. Leaders must devise new strategies to grow, capture market share, and protect their turf – all to continue their climb up the Endgame Curve. Whether they are conscious of their Endgame strategy, they must constantly analyze their next acquisition target or assess a new growth plan. The race to capture market share comes into full swing and, as it progresses, positioning of the leaders frequently changes. From the mid-1990s until 2005, the large ARM players were fixated on amassing size. Small players that secured collection contracts with large financial institutions, telecom companies, hospital systems, and the U.S. Department of Education expanded dramatically by opening new call centers. Many attracted the interest of substantial private equity firms intent on putting money to work in growing, fragmented, and profitable industries. With the exception of GC Services, nine of the 10 largest collection agencies during this timeframe went through at least one ownership change. Industries can stay in the Scale Phase for many years, and the ARM industry feasted for more than a decade. The Focus Phase is characterized not so much by a blizzard of merger activity like in the Scale Phase, but by megadeals and large-scale consolidation plays. The goal now is to emerge as one of the few global industry powerhouses. The rules of the game are well established at this point, and only an outside event or an industry incumbent may be able to cause significant change. This stage occurred in the ARM industry from the mid-2000s until the real impact of the Great Recession set in. Unlike Scale Phase acquisitions, where larger competitors usually gobbled up the small, weaker players, Focus Phase consolidation plays are usually “mergers of equals.” During this era, NCO Group and West Corp were taken private by large private equity firms. Teleperformance, a global contact management firm, acquired Alliance One in 2007. NCO purchased OSI, combining two of the largest ARM companies in the U.S. India-based Firstsource acquired MedAssist in Kentucky, their second acquisition in the U.S. ARM industry during that era. Large collection law firms Mann Bracken, Eskanos & Adler and Wolpoff & Abramson merged to form Axiant. The ARM industry continued to attract substantial attention during this stage, particularly from strategic and financial buyers, as a result of its consistent growth and the cash flow performance of its successful companies. The Balance and Alliance Phase: After the flurry of activity that occurs during the Focus Phase, the Balance and Alliance Phase is a calmer phase where further consolidation is limited or nonexistent. Reasons typically include antitrust or industry complexity. The top of the Endgame Curve, or the Balance and Alliance Phase, is the final step in the Endgame journey. According to A.T. Kearney, companies in this stage maximize their cash flow, protect their market position, and adapt to changes in industry structure and new technological advances. Balance and Alliance Phase companies often experience difficulty in growing market share because they have maximized their market penetration. Barriers-to-entry emerge and industries the reach this stage are populated by very few, very large companies that have won their industry consolidation race. They are the unquestioned leaders in their field and can be successful for a long time, depending on how they handle and protect their prime position. The ARM industry is not quite at this stage. If you asked me 10 years ago, I never thought we would get there. Credit grantor clients always demanded more (not less) competition among its collection vendors, and desired more (not fewer) debt buyers competing for their portfolios. Because of the converging influences of tumultuous economic conditions and intense regulatory oversight, clients are consolidating vendor networks and small and midsized ARM companies are finding it more challenging to stand alone. The ARM industry finds itself somewhere between Stages 3 and 4, with a major dose of consolidation yet to come. I am confident that in the future, we will look back on this as a time when the ARM industry went through a massive consolidation.